There are ten key topics which are central to the Eco-Schools programme: Energy, Water, Biodiversity, Marine, School Grounds, Healthy Living, Transport, Litter, Waste, Global Citizenship. These are woven into our curriculum and extra-curricular activities from the Foundation Stage to Year 6. The opportunity to integrate environmental and sustainability issues into the life of school, impacting positively on the school ethos. Opportunities to deliver the Eco-schools programme through curriculum work. The opportunity to raise achievement, and enhance learning styles and thinking skills. The potential for financial savings. Benefits for the community and the whole school. Access to a network of support agencies. A prestigious award at Bronze, Silver or Green Flag Level for us to be proud of. Opportunities for local and national publicity. Links with other schools in the UK and across the globe. Miss Hay is our Eco-Schools leader and we have a representative from each class. The children are enthusiastic about Eco-Schools and enjoy making a difference to our environment. Keep an eye on this page where we will keep you up to date with all of our Eco Adventures! The Eco Council created our Eco Code together. The children had some amazing, creative ideas! Here are the children in Sycamore class enjoying making Eco-Bricks. Here are some pictures of displays around our school showing how we recycle materials. As you may be aware we are taking part in an Eco-Bricks project. Thank you to those who have brought in plastic to help make our Eco-Bricks. Some bricks have already been made which is fantastic! If you have any clean plastic bottles and plastic that you would like to recycle please bring them into school. There is a list of plastic we could use to make our Eco-Bricks on our most recent newsletter. Here the Eco-Council are working with The Real Junk Food Project. The children decided that we are going to build a draft lobby in order to protect the food stored inside the building. They decided where the draft lobby is going to go and learnt how to make an Eco-Brick effectively. They had a fantastic time! In November we took part in a whole school ‘Switch off Fortnight’ campaign. Our Eco Council campaigned to encourage the school to save energy by switching off their lights, computers, laptops, printers, chargers and many more when they are not being used. The council members monitored the use of energy around school at the beginning of the fortnight and at the end to monitor impact of the campaign. The results were great as there was a significant difference in the amount of energy saved. Here we are ready to present an assembly to the whole school about our action plan and our Eco work so far! Our Trash-tastic Eco Fashion Show! The whole school got involved during our Eco Week in creating clothing from recycled waste. The children enjoyed working as a team, designing and creating their pieces. We held a fantastic 'trashion' show at the end of a wonderful day! PE on Healthy Living Day! 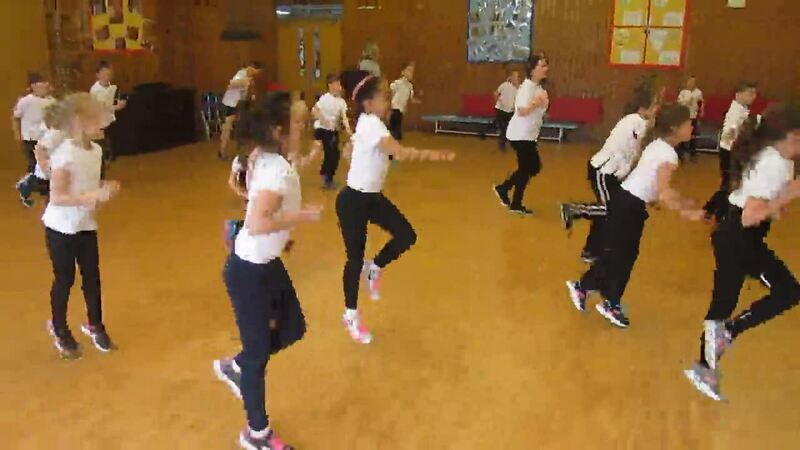 All the children throughout school benefitted from an aerobics session led by Miss Sinclair from St. Wilfrid's. Here we are having fun while we exercise! In March we took part in 'The Great British Spring Clean' with representatives from Wakefield MDC. Here we are with five huge bags of rubbish from our local area. The children were very proud of their work in the community! In January our creative Eco council made a new monster for the Shanks Waste Management Recycled Monster competition. We named our monster Reggie the Roving Recycler as a nod to our favourite rugby team, Featherstone Rovers. We also decided that Reggie would scare litter bugs away around Featherstone and collect dropped litter in his special bag. The children had great fun working together to create Reggie. In December 2016, the Eco Council decided they would like to support the local Faithnet food bank at South Featherstone Gospel Hall. Representatives from the Eco Council delivered the donations with Mrs Tonks. We are very proud of the contribution our school has made to support the lives of vulnerable people in our community. Here we are with our huge donation! In gardening club we enjoyed creating scarecrows for the allotment! Here we are with our champion pumpkin at Farmer Copley's Farm Shop for the pumpkin festival. Our largest pumpkin weighed in at an enormous 9.78kg! The gardening club are very proud of it! Our wonderful gardening club have made a great start looking after the allotment! We have been out in the local area around school collecting litter with representatives from Wakefield Council and Wakefield District Housing. We collected 5 huge sacks of litter! Our fantastic volunteers have been tirelessly collecting litter every Monday at playtime. Well done girls and thank you! Frank - N - Fev! We created a Rubbish Monster for a Keep Britain Tidy recycling competition. We had great fun putting our monster together and everyone loved the result! Fingers crossed for our fantastic entry! Look at these photos of us at work!